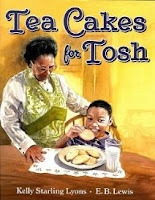 Even more than Tosh loves his Grandma’s tea cakes, he loves her stories. She tells him about the history of the tea cakes, all the way back to her ancestor who made them; a slave, who would bravely make extra’s for the slave children. When Grandma starts to lose her memory, it’s going to be up to Tosh to remember, and make tea cakes for her. I love that even though this story appears short and simple, it’s actually very multi-faceted, and incredibly well written. It’s a wonderfully poignant story that spans generations and is a must have for a school library. EL (K-3), EL –ESSENTIAL Reviewer: Stephanie Elementary School Librarian & Author.